Russian Su-34 bombers, additionally equipped with air-to-air missiles, have set out on their first mission in Syria, said Igor Klimov, spokesman for the Russian Air Force. 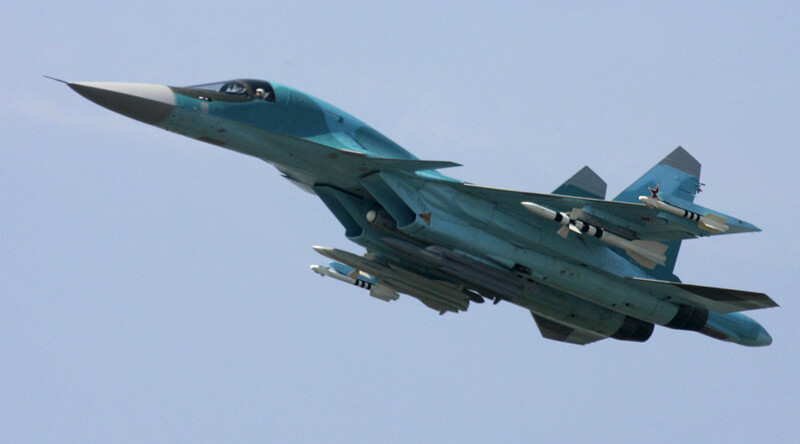 “Today, Russian Su-34 fighter-bombers have made their first sortie equipped not only with high explosive aviation bombs and hollow charge bombs, but also with short- and medium-range air-to-air missiles," Klimov said. "The planes are equipped with missiles for defensive purposes," he added. The missiles have target-seeking devices and are “capable of hitting air targets within a 60km radius,” he said. Turkish F-16s shot down a Russian Su-24 bomber operating in Syria on November 24, with Ankara claiming that the warplane had violated Turkish airspace. Moscow has rejected the claims, saying that according to its military intelligence the Su-24 never left Syrian airspace. On Monday, Turkey's prime minister said that Ankara will not apologize for the incident. "No Turkish prime minister or president will apologize ... for doing our duty," Ahmet Davutoglu told reporters after meeting NATO Secretary-General Jens Stoltenberg in Brussels. In the wake of the downing, President Vladimir Putin on Saturday signed a decree imposing a package of economic sanctions against Turkey. The measures include banning several Turkish organizations and the import of certain goods. Under the sanctions, the visa-free regime for Turkish nationals traveling to Russia will be suspended starting next year. The Russian government has also been tasked with introducing a ban on charter flights between Russia and Turkey and to enhance security control at Russian ports on the Sea of Azov and Black Sea. Russia has been conducting airstrikes targeting Islamic State militants (IS, former ISIS, ISIL) and other terrorist groups in Syria since September 30. The strikes were launched after a formal request from Damascus. Russian jets have been carrying out sorties from Moscow’s Khmeimim Air Base in Latakia. On Thursday, Moscow recalled its military representative from Turkey. At the same time Russian Defense Ministry said that all channels of military cooperation with Ankara were suspended including a hotline set up to share information about Russian airstrikes in Syria.